Did you know that there are at least over 10,000 varieties of mushrooms, and probably even 10,000 more, even. They are everywhere, dear reader, and occasionally, in my tuna soup – ewww! Or yum, I’m not sure which at present. I will let you know when I decide. Anyway, a lovely way to enjoy the little buttony ones, those that won’t give you the screaming heebie jeebies, is to fry them in a little garlic infused oil and add some roasted pine nuts, along with a handy handful of chopped spinach. Mix gently (people with opposable thumbs and forefingers) until the spinach has wilted and surrendered, and fling on top of a conveniently placed plate of fettucine. Add a garnish of roasted flaked almonds if you dare. Enjoy. You’re welcome. You may add some sliced, sun-dried tomatoes, too, if you’re that way inclined. 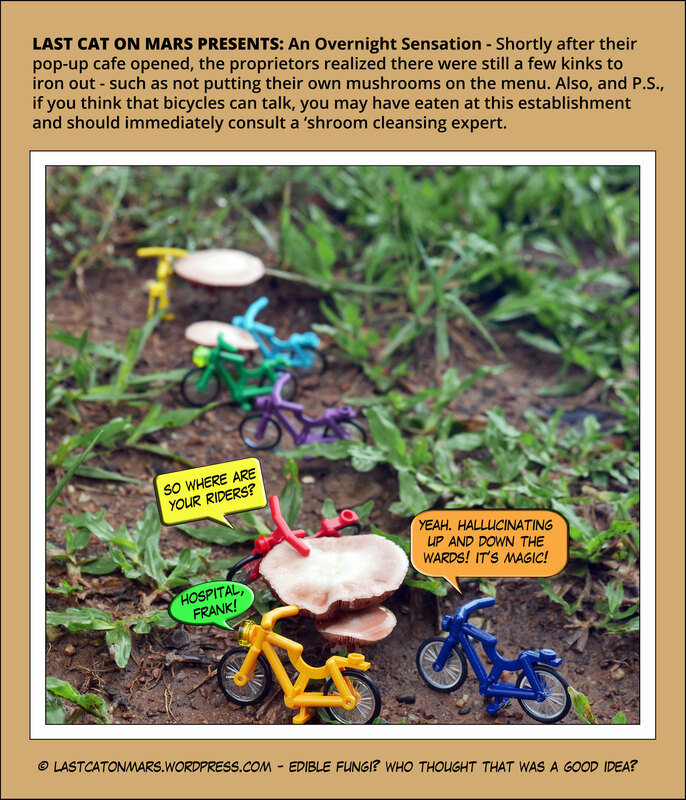 This entry was posted in Variety Show and tagged bicycles, cartoon, comic, lego, mushrooms on March 22, 2017 by Jay Verney. Yes, I love tiny houses. Their teeny, tiny cat doors? Not so much. However, I applaud the efforts of human and feline alike to reduce their carbohydrate or even carbon pawprints by practising minimalism, except for tuna. Tuna, tuna everywhere, and every steak a treat, that’s my mantra. If you’re serious about joining the Less Is More movement, check out that wonderful guy Leo Babauta, the zen habits guru to the universe. Even Leo’s website is full of white space and no-thingness. 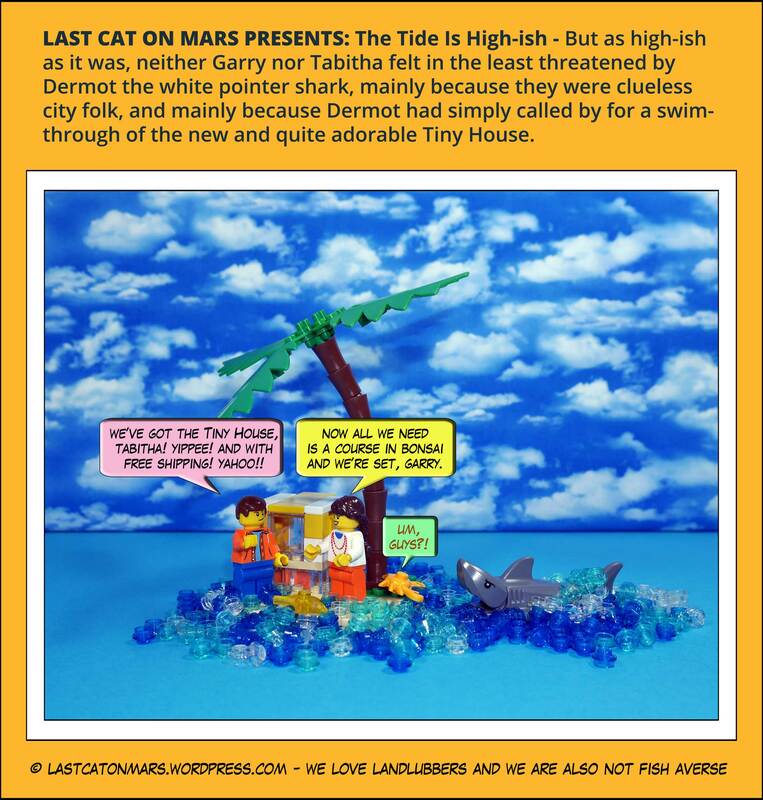 This entry was posted in Variety Show and tagged cartoon, comic, desert island, island, lego, minifigures, shark, tiny house on March 15, 2017 by Jay Verney. And yet, I can’t help thinking that a good quality 50+ SPF sunscreen would do those baconers far more good than any amount of mislaid mud. Especially down the track a little, when breakfast bacons, I mean, beckons. Is it not bad enough that one’s daily mullet is so frequently tainted by a silty, sandy scent? I think it’s something to do with the pond life here on Mars. On the other hand, who wants to make a rash, or even rasher decision at a time like this? This entry was posted in Variety Show and tagged cartoon, comic, hogs, lego, mud, pigs, resort on March 8, 2017 by Jay Verney. Last Cat On Mars Presents: Rainbows – Could They Be Any More Beautiful? Hmmm? Could They? So I made a quick trip to the third rock this weekend and look what I saw! And you, too, fellow, planetarians and Martians, can see it in its full splendiferous and colourful magnificence on SBS TV tonight at 8.30. Any minute now, in fact, if you live in the southern states with their funny hour-ahead cult of the sun. Probably on SBS on Demand, too, maybe, perhaps, check it out anyway. And if you need more about Mardi Gras – and who doesn’t? – check out the Mardi Gras website. 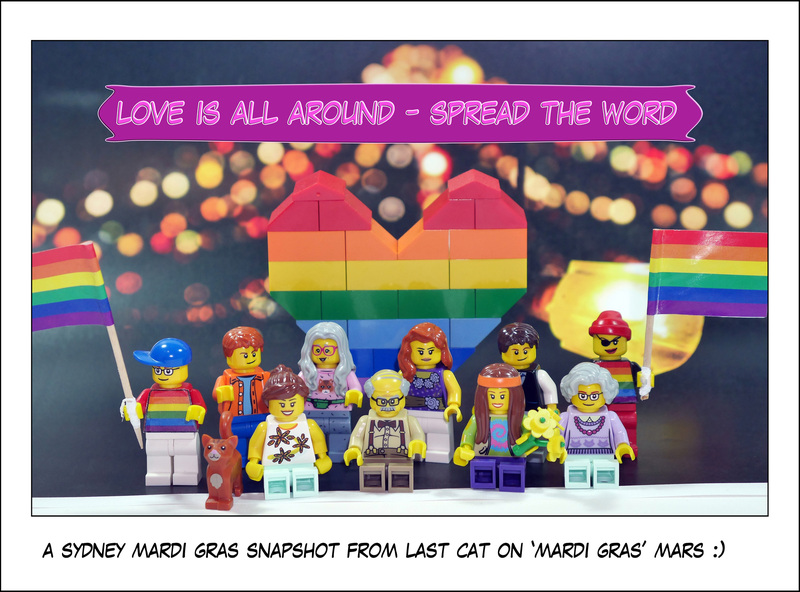 This entry was posted in Snapshots, Special Occasions and tagged cartoon, comic, Last Cat On Mars, lego, mardi gras, minifigures, rainbow flag, rainbow heart, Sydney on March 5, 2017 by Jay Verney. Too soon to revisit Selfieville and its strange inhabitants wherever they may find themselves? I think not. And the sooner little Brutus realises that, like Hermia in A Midsummer Night’s Dream, he may be little but he’s totes fierce, the sooner he can flee that rather gorgeous flytrap of an island and get his own Dogagram account. Unless, of course, his human frenemy, Tasty McMeatus is about to become his very closest chum, if you know what I mean. 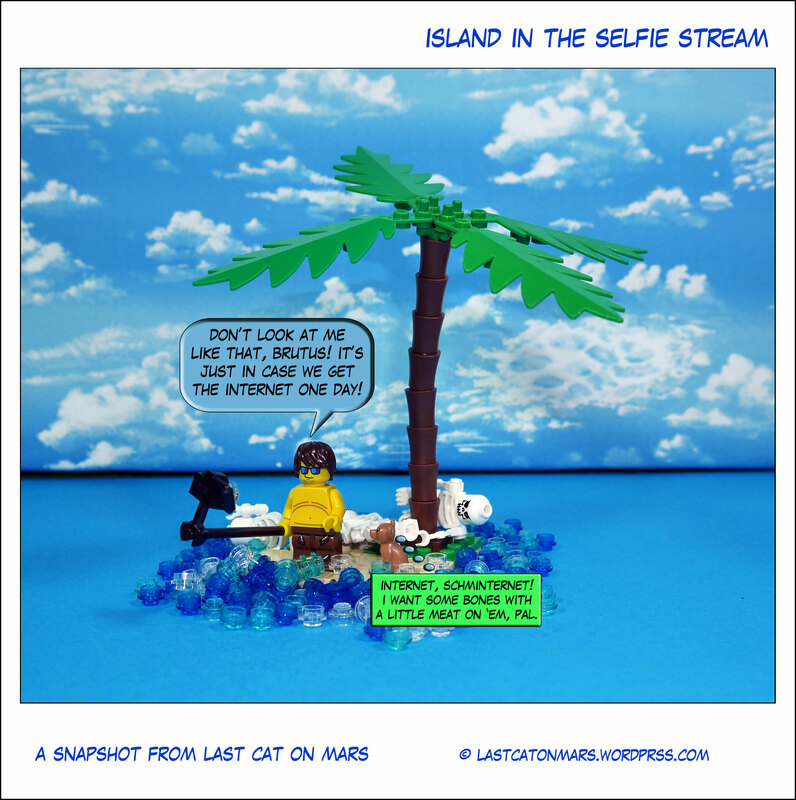 This entry was posted in Snapshots, Variety Show and tagged cartoon, comic, desert island, dog, island, lego, minifigure, selfie, selfie guy, skeleton on March 1, 2017 by Jay Verney.